LISTEN NOW! 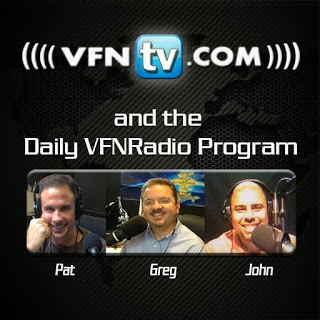 Greg, John, and Pat discuss who we are at VFNRadio. Today many are listening to procrastinators. However, God has called us to be a “now word”. This is truly a networking that God is building and it exists for whatever He wants to share with His people. By the grace of God we are to share a now word a perspective of what God is saying at the moment. It’s important enough just to hear the news but you need to know what to do with news you hear. We spend time abiding with God daily believing that God speaks to His sheep and they hear His voice at the same time keeping the conversation light and helping as many to abide with God and hear His voice for themselves. We make this conversation available in so many ways including the VFN Torch, VFNRadio App, Television, The Torch newsletter podcast and social media so together we can reach the world for Jesus. Greg, John, and Pat discuss today being the 150thanniversary of the Gettysburg Address, November 19, 1863. They continue to speak in context of history and all the injustice that has happened in times past and continues to happen even today. Greg shares of how he has recently seen some things unfold that are quite puzzling as he shared that he saw a man get life in jail for what two officers did and they were able to keep their jobs, shooting fifteen times at an innocent person. Then just a short time after that he saw where a man who pulled the trigger at police officer and nothing came out was sent to jail. They continue to share their thoughts regarding how God is bringing America to the point of having a conversation. It wasn’t until William Wilberforce made the case in Great Britain that slaves were eventually freed in England. While slavery was coming to an end in Great Britain, America slave owners panicked thinking they were in jeopardy of potentially losing their slaves so they treated them harsher. They continued discussing what was happening right around the time of the Gettysburg Address that the country was in a horrific civil war that claimed over 700,000 lives which was preceded by the 2ndGreat Awakening. This was a major time in history when the 16th President of the United States Abraham Lincoln was transitioning a nation to the original intent of the Founding Fathers that all men were created equal and that civil rights were for all men. The nation finally made it through the civil war and it wasn’t until 100 years later when Dr. Martin Luther King, Jr. gave his “I Have a Dream” speech on the national mall pointing to the fact that we are still not completely there. We must deal with racism. There are not different Americans we are all Americans. They further discussed the prophetic word given by Rick Joyner when he said that African Americans would be used powerfully to bring about the 3rd Great Awakening. If we humble ourselves before God and get His perspective and turn our hearts back to God and to each other we will see a third Great Awakening touch this nation.